Hip-Hop And Superheroes Inspire 'Luke Cage' Showrunner Cheo Coker Cheo Coker was a well-respected journalist chronicling hip-hop and pop before he moved to film and TV. His latest gig is as showrunner on Marvel's highly anticipated black superhero series, Luke Cage. 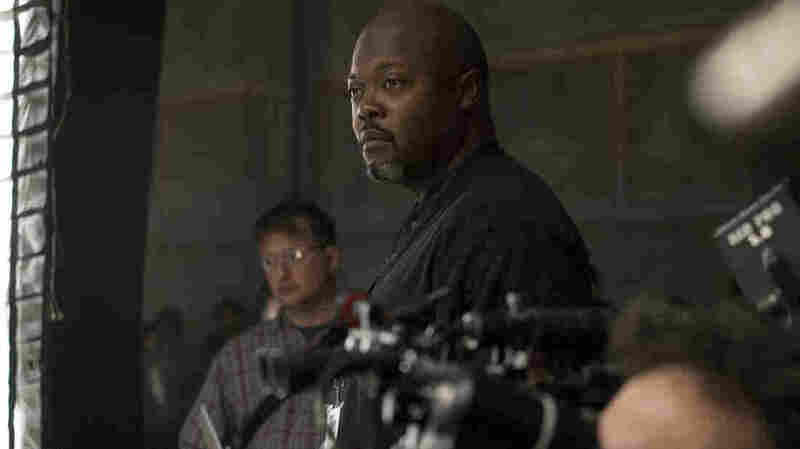 Showrunner Cheo Coker on the set of Marvel's hotly anticipated new series Luke Cage. As protests over police shootings of black men top the news, Netflix debuts a show on Friday about a bulletproof black man. It's called Marvel's Luke Cage, and it's based on one of Marvel Comics' first black superheroes. Step into executive producer and showrunner Cheo Coker's cramped office in Hollywood, and you face a wall plastered with comic books from the 1970s and '80s. "That's where my love of comics started." he says. "Because when I read those I mean I was, what, sixth grade?" When you see a black man with power doing things, I think it's the visceral thrill people had when they saw 'Shaft' when it came out in the '70s. As Nina Simone plays on his computer, Coker looks lovingly at the titles: Wolverine, The Black Panther, and, of course, Luke Cage, Hero for Hire. The storytelling in these books inspired Coker in his latest job: He's bringing Luke Cage, a superhero inspired by blaxploitation films of the 1970s, to television. "When you see a black man with power doing things, I think it's the visceral thrill people had when they saw Shaft when it came out in the '70s." Coker updated Cage by adding a little hip-hop swagger and placing him in a modern Harlem, where he faces an arms-dealing crime lord and his corrupt politician cousin. Super-strong and bulletproof, Cage is also an ex-convict lying low — he sweeps up his friend Pop's barbershop and avoids the impulse to act like a superhero, even when Pop implores him to. Speaking at a reception in Los Angeles, Jeph Loeb, the executive vice president of Marvel Television, said Coker's passion for the character landed him the showrunning job: "He talked about what a difference Luke made to him personally. Growing up as a young black kid in America and being able to go down to comic book stand and see someone that connected with him." Running this series is a job Coker — now 43 — seems born to fill. He grew up the grandson of a Tuskegee Airman and the nephew of an editor of Essence magazine. His uncle, Richard Wesley, wrote the classic films Uptown Saturday Night and Let's Do It Again. "At one point, he was working on a screenplay with Rick James," Coker says, "and Rick James would call the house. And we'd run to the record room and play 'Super Freak' as loud as we could." After boarding school in Connecticut, Coker attended Stanford University, where he would make a key decision: He began covering the emerging rap scene in the early '90s for magazines like The Source and Rap Pages and later, The Los Angeles Times. "It was electric. Because back then, there was no Instagram. There was no Twitter," he remembers. "When you went to see a rapper, you went to their house. Yes, there were publicists, but there was no filter." Coker made a name for himself. He got punched by a member of the Wu Tang Clan and delivered definitive coverage of one of the era's biggest stars, the Notorious B.I.G. "The first time I met Notorious B.I.G, he was standing right on the stoop, 226 St. James in Brooklyn. Trife and Larceny from Junior M.A.F.I.A. walk up — they wanted a gun so they could rob somebody. He was like, 'I don't know where the gun is.' And as soon as they went off he was like, 'I know exactly where the gun is. I don't want to be a part of that.'" The show is what I call inclusively black. It's an unadulterated hip hop show. But it's done in such a way where anyone from outside the culture — not just hip hop culture, outside of geek culture — it can play against anything on television. "Cheo was one of a handful of inner circle members of what we used to call the Mind Squad," says, Jonathan Shecter, co-founder and first editor-in-chief of The Source magazine. "In Cheo's case, we had a guy that was incredibly bright, who was a great writer, but I think what stood out was that he saw some of the ways, early on, how hip-hop was going to be bigger than just music." Coker wrote his first movie script with his uncle, a hip-hop based story called Flow. He wrote a book about the Notorious B.I.G. and co-wrote the 2009 movie Notorious. Eventually, he joined the police drama Southland alongside writers who had worked on The Sopranos and ER. "All these incredibly experienced writers and I'm like, what the hell am I doing in this room? And then I realized, okay, like, I'm the only person who's been in South Central with an AK-47 on the ottoman and a police helicopter outside." After stints on NCIS: Los Angeles and Showtime's Ray Donovan, Coker has united all his major influences on Luke Cage. Even the episodes are named after songs by '90s rappers Gang Starr. "The show is what I call inclusively black. It's an unadulterated hip-hop show. But it's done in such a way where anyone from outside the culture — not just hip-hop culture, outside of geek culture — it can play against anything on television." Coker knows it's a big gamble. But he also knows his career is mostly an example of how art which springs from a specific culture can have a universal message.